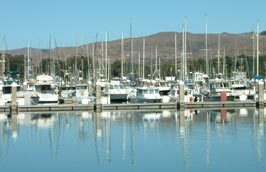 The Bay & Coast - The Bodega Bay California area covers approximately 10 miles of coast. The area spans from 127 acre Doran Beach, up past the Bay and along the coast to Goat Rock Beach at the mouth of the Russian River. The Bay is public property on the two arms, with restaurants, the marina, and shopping nestled in between. The stretch of coast from Bodega Bay to Goat Rock is all state property with publicly maintained access to every beach. Things to Do - Click to the Things to Do page for information on many of the area's most popular attractions. Photo Gallery - View the Photo Gallery pages to get a candid feel for the beauty of Bodega Bay.